Dog separation anxiety is usually seen in dogs that have not been left alone very often, or that have just returned from boarding kennels or perhaps there has been a major change in their lives… moving house, death in the family, separation of carers. When does dog separation anxiety show? The behavior usually occurs when you get ready to leave your dachshund alone or just after you leave. When you pick up the car keys or open the garage door or shut the front door, or perhaps just after you drive out the gate. The owner may be unawares of the extent of the dog’s anxiety as they are absent; often the signs are when the owner returns to the mess the dog has made and perhaps to neighbors complaints about the noise and barking. Punishment is not the answer for this problem; it will only make things worse. Exercise and playtime should be at regular times not just a spur of the moment when you have a spare minute. A good variety of toys should be available and changed to keep your dog interested, don't keep the same couple of toys for years there are a wonderful range of interactive toys available. Dachshunds are very social animals, so you can understand that they don't like being left alone especially if it is all day. 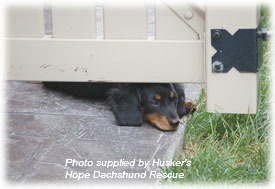 Don't allow you dachshund to follow you around the house when you are carrying out chores. Don't make a fuss of the dog before leaving or returning as this can trigger the anxiety. You can leave the dog with a Kong toy full of treats or perhaps a new chew toy. Some owners find leaving the radio or TV on, seems to comfort some dogs. Overcoming anxiety caused by separation can take time and perseverance. Start by carrying out you normal leaving routine and then instead of going, sit down quietly with you dog repeat this several times – next move to you exiting but again do not complete the movement, sit down again with your dog. Eventually you should be sitting outside, go out and shut the door, wait a couple of seconds, then move to several minutes and when returning re-enter don't make any fuss just pretend this is all no big deal. Repeating these exercises until the dog is almost bored with it all and doesn't worry which side of the door you are on. When your dog is happy with all this and there is no anxiety then move on to actually driving away again, only go for a few minutes, ask a neighbor to assist with this to listen for any noise or barking. Continue as long as the dog shows no anxiety and slowly extend the time you go away. Patience and time is needed for this problem, the sooner you realize there is a problem then start the training, it may take weeks or months, every dog and every situation is slightly different. It is advisable not to have a set routine when leaving you dachshund as this works as a trigger for the anxiety, so change things around, don't always pick up your bag first or rattle the car keys or lock the back door just before leaving. There is a product known as Dog Appeasing Pheromone (DAP) that calms and reassures dogs that are in stressful situations,many owners have found success with this. 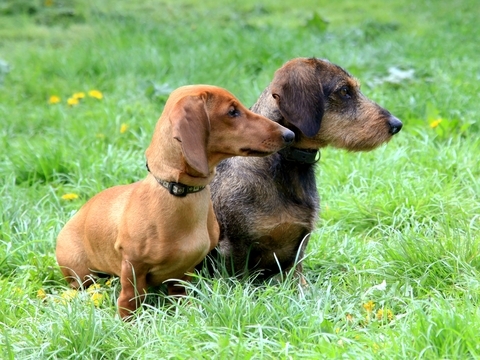 As well as the training you are giving your dachshund, it is advisable to spend time socializing your dog a good way is to meet up with other dachshunds for a play-date. Another good social experience is to find a doggy day care that runs an activity program and will work with your dog to help develop his socialization skills. Take your dachshund on interesting walks, a dog friendly beach, a bush walk or park, for your walk don't do the same route week in and week out. Don't push your dog into situations that frighten him, build your dog’s confidence slowly over time. Dog separation anxiety will take some time to overcome, but with patience and consistence you will succeed.